A woman named Ann Dilley is taking the term “career student” to an entirely new level. 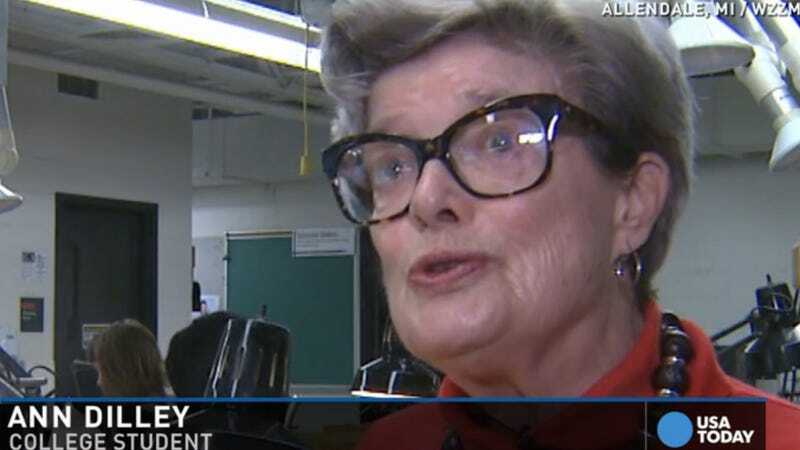 After graduating from a Connecticut college in 1950, Dilley moved to Grand Rapids, Michigan with her husband, where she heard a life-changing speech that sent her back to school, according to WZZM. Since then, 86-year-old Dilley’s been hard at work in the back of Grand Valley’s metal shopping class, turning old trinkets into fresh jewelry pieces. For her birthday, her family created the Ann Dilley Jewelry/Metalsmithing Scholarship to financially help students who are also interested in jewelry-making craft. As for Ann, she’s open to continuing her classes until she’s 102 or whatever. She’s not picky.